No, no, no. This part where you have 18 committees and ruin the design? That’s where you’re supposed to buy it. We are used to broad discussions on procurement and force development. The pre-requirement requirements have to be vetted by a blue-ribbon committee for vetting before formal review for potential review. 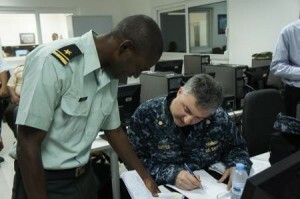 After a semester of National Security and Defense Industrial Capacity at Georgetown, it was like whiplash sitting in African Security and hearing a Senegalese officer discuss his one-man assignment to develop requirements for, procure, and fly aircraft back to Senegal for the Armée de l’Air Sénégalaise. Such breathtaking freedom comes with a price, since the procurement program consisted of only one aircraft. Strategic September is a project dedicated to the grand art of Strategy, from force planning to the blue ribbon commissions as the colossal body of “Blue Force” navies the world over make ponderous course corrections. From 7-13 October, we will discuss the potential for our yet developing compatriots south of the Mediterranean. These are not merely the conventional problems of defining missions and smaller budgets. While a vast body of work is dedicated to “security assistance”, we will endeavor to discuss the internal challenges, solutions, and questions faced by African Navies. The Senegalese officer not only discussed procurement, but the harrowing issues of government corruption, loyalty to the goverment vs. the state, and the disturbing threat of coups in nearby nations. We pursue the challenges of professionalism, sailors duel-hatting as pirates by night, patronage recruiting, and the like. Join us, won’t you?